Alternate Latitude - 10% OFF. Valentine's night dinner of Surf and Turf followed by chocolate covered strawberries and Champagne. This Voyage 440 Catamaran was the first and only catamaran ever to win Cruising World's overall "Cruising Boat of the Year" award. 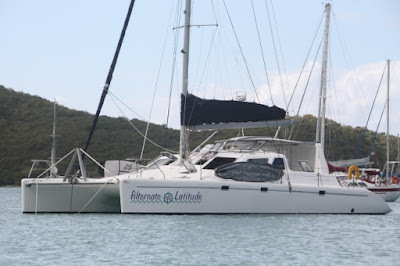 This Alex Simonis designed, South African built bluewater cat has a well earned reputation for excellent performance, outstanding build quality, and head turning eye appeal that make her stand tall among other cats in her size. You will experience the security of a licensed Captain, local knowledge and flair on a comfortable & beautiful sailing vessel. Your floating hotel offers 3 queen staterooms, each with its own bathroom. The boat comes outfitted with toys aplenty, with 2 stand-up paddle boards, snorkel equipment for the whole gang, floaties & a dingy, your tender for shore excursions. Travel to multiple Caribbean islands via your own personal charter & visit coves & islands. Don't Miss Super Bowl LI! Charter a Jet Now!